It's League finals time as the Peninsula Athletic League got under way today. Many more will take place next week. Who are the runners to watch for as we make our way to the section finals? Check out the following link to an article that describes Palo Alto's Alok Subbarao's quadruple in a dual meet against Los Altos. It's written by his coach Jeff Billings who briefly describes how far Alok has come during his high school career by finishing his post with "its not about how fast you are, but about how far you have come." A great story of perseverance and accomplishments. 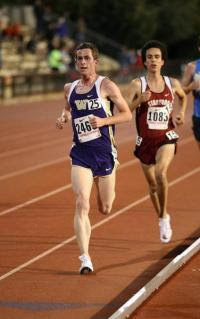 On the Palo Alto Track site you will also find a link to http://xcstats.com/ which is a great tool for coaches that keeps track of all their athletes times throughout their time in high school. Here are several links to results from track and field meets held these past two days. (04-22) 21:48 PDT -- When Los Gatos High senior Colin Quirke was a little boy, he didn't chase his father around a baseball, football or soccer field. His childhood athletic education involved a more esoteric setting, but no less inspiring. 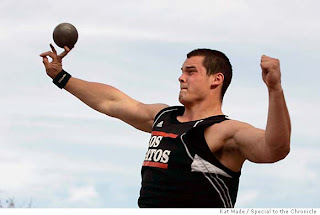 Paul Quirke, a shot putter for Ireland in the 1992 Olympics, brought up his son in a world in which he mingled with discus throwers and shot putters, many of whom were legends in the sport. If you have any more links, please feel free to share them below in the comment box. More to come on Sunday as we catch up with the James Logan Top 8 Meet, Phillips-McCain, Woody Wilson, Mt. SAC and a few more meets. Check out the following article courtesy of the New York Times featuring Sara Hall (formerly Sara Bei of Montgomery High School in Santa Rosa). SARA HALL experienced an instructive epiphany in 2006. 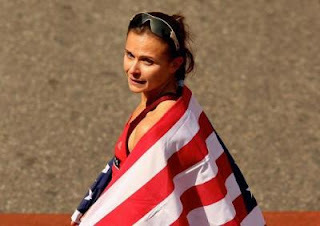 In the fall, she’d won the national road-running championship for 5K (3.1 miles), a distance she specialized in at Stanford. At the time, she considered herself a 5K runner. So did everyone else. The coverage of Track and Field meets keeps improving by the day and this past week was no different many videos are online for your viewing pleasure. Here are my picks for must see videos that will either inspire or amaze you. 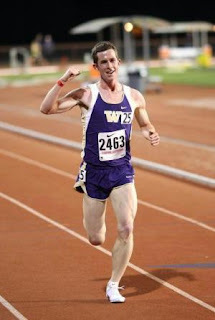 WHEN Jake Schmitt arrived in the Pacific Northwest on New Year's Day of 2007, he had to wonder whether his decision to transfer to the University of Washington's track program from Cal was really such a good idea. Hospitalized the night before he left with tonsillitis, Schmitt threw up on his flight to Seattle, and when he arrived on campus, it was snowing. Needless to say, the Redwood High graduate was having some second thoughts. "At that point, there were a million things going through my mind, but mainly it was, 'What am I doing here?'" Schmitt said with a chuckle. "But I just kept smiling and kept my head up." Lynbrook's Eric Surprenant gets this week's award following another impressive performance over the really long hurdles race (full 400m.) at the Stanford Invitational. Thanks to Hank Lawson and Keith Conning, you can view the top marks for the Central Coast Section (CCS), North Coast Section (NCS) and San Joaquin Section (SJS). If anybody has the top marks for the Northern Section, San Francisco Section and the Oakland Section, please forward them along. Joey Villasenor couldn't have selected a better role model than the late Steve Prefontaine, a former Olympic track athlete who also was a star in college. "I really look up to Steve Prefontaine," said Villasenor, a Lindhurst High athlete who is participating in five sports in this, his senior year. "Looking at films about him, I've seen his passion for running, and I have that same passion, too." Prefontaine won three national cross country titles and four 3-mile/5,000-meter collegiate outdoor titles while running for the University of Oregon. He went on to compete in the 1972 Summer Olympic Games in Munich, Germany, finishing fourth in the 5,000 meters. At the time of his tragic death in 1975, he held every American distance record from 2,000 to 10,000 meters. Villasenor reveres Prefontaine so much that he lives his life by a quote attributed to Prefontaine — "Anything less than your best is sacrificing the gift." And Villasenor has the gift. Make that gifts. Please share links to any newspaper coverage I may have missed. Check out this great article from a August 2nd, 1971 Sports Illustrated written by the legendary Oregon coach, Bill Bowerman (pictured to the left with his star pupil, Steve Prefontaine). He describes all the elements of proper running form that are still true this day. I was fortunate to attend San Francisco State University while Harry Marra was the head Track and Field/Cross Country coach and was his track and field manager. I had no idea what an education I would get in coaching from one of the best technical coaches in the United States. While I was a distance runner in high school, I was able to learn about ALL the events from Harry and apply what I learned to starting the track and field team at Crystal Springs Uplands in 2002. Harry is now focusing his efforts in the decathlon with one of the top decathletes, Paul Terek. The hall of fame election is a well deserved recognition for a great coach.